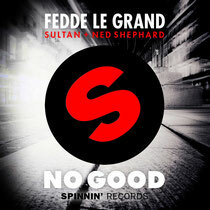 Out this week, ‘No Good’, is the latest track from Fedde Le Grand, Sultan + Ned Shepard and has already garnered support from Dada Life, Sander van Doorn, Nicky Romero, R3hab, David Guetta, Axwell, Hardwell, Afrojack, Steve Aoki, Alesso, ARTY, Sebastian Ingrosso and many more. Over the past decade, Le Grand, when not unleashing his own tracks, takes time to give the next generation of talent a foot up. 1327 bedroom producers entered the official Beatport Play ‘Rockin’ N’ Rollin’’ remix competition, making it one of the most successful ever, while his supporting producer Q&A session across Facebook was so well received Le Grand plans to make it a regular event. With a huge summer tour schedule that includes dates at Ushuaia in Ibiza, Ultra Music Festival Europe, the Balaton Sound Festival, Tomorrowland, Loveland, the Zurich Street Parade, Mysteryland and more, 2013 looks like being another top year for the Dutch DJ/producer. Have a listen to the 'No Good' below. I'm very happy to uncover this website. I want to to thank you for ones time just for this wonderful read!! I definitely enjoyed every bit of it and i also have you book marked to check out new things in your site.